We bring together two organisations with different perspectives on geographical indications to discuss the best route forward for this unique form of protection. 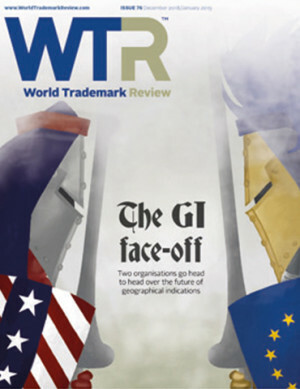 World Trademark Review speaks with Allison Cantor, principal counsel at ESPN, about how she balances her role as the company’s sole in-house trademark counsel with her other commitments, the difficulties posed by the implementation of GDPR, and much more. We speak to Daniel McKinnon, head of global brand protection at New Balance, about his approach to trademark enforcement, “paltry” damages awarded in China, the problems of “parasite brands”, and much more. In an in-depth discussion with Sophie Anger, associate general counsel of marketing properties for the global petcare unit of Mars Incorporated, she offers enforcement tips, explains how efficiency is her guiding principle, and much more. The historical ‘us versus them’ mentality between marketing and legal departments is not an inevitability – with the right approach, the relationship can be productive and mutually beneficial. The long-running face-off between Apple and Samsung over the design elements of their phone products offers a number of key takeaways for rights holders. Can anonymous internet comments be used as evidence in trademark litigation? While the role of anonymous confusion is still somewhat muddied by inconsistent approaches, parties should be prepared to handle concerns as to relevance, hearsay and authentication. Sino-foreign joint ventures are the most popular way to access the Chinese market, but business owners should beware the traps that lurk every step of the way. With the E-commerce Law soon to take effect in China, brand owners take stock of the significant effect on online enforcement efforts. The Indian trademark office has made significant strides in improving its operations, efficiencies and digital efforts over the past 18 months. We look at how these could shape trademark protection in India in the coming years. The ability to raise the own-name defence in Europe is about to come to an end. This article examines the consequences of recent own-name legislative changes for businesses in Europe. Following a rise in the number of non-traditional trademark registrations, practitioners should be aware of the differences between obtaining protection in the European Union and the United States. ICANN policy making has not always been followed closely by most rights holders, but a strong say from brand owners is essential as key policies are developed. Genericism: is the trademark education video the new norm? The recent Velcro video was highly successful in generating discussion about the use of the company’s trademark, providing crucial insight into brand communication strategies. In our latest opinion piece, we reflect on the scale of the Chinese government's brand incubation drive, and how this ambitious project is one that will have consequence for all rights holders - no matter where in the world they are located. There has been much criticism regarding the difficultly of filing an IP dispute in China. However, the country is streamlining the process of navigating the judicial system, with the goal remaining to stop infringements. India is removing policy barriers to attract investment, while policy initiatives designed to improve IP rights enforcement look set to yield results. However, the availability of infringing, counterfeit and lookalike products is also on the rise. There are advantages to protecting IP rights in Italy, including the possibility of starting legal action before registration has been granted in one of the 22 specialised courts across the country. The new North American Free Trade Agreement includes stronger measures against counterfeiting and piracy, including the ability to stop the entry and exit of suspected counterfeit products. Parallel imports in Russia were once subject to the same treatment as counterfeit goods – but the golden age is over, as a compromise has been struck with regard to the national exhaustion of rights. While there is an arsenal of tools with which a rights holder can address infringement, each requires careful consideration. The initial choice of remedy is a good place to start.